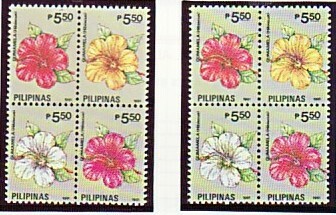 The Philippine flowers mini-stamp definitive series comprises more stamps than any previous Philippine postage stamp series, in spite of the fact that it consists of only stamps for the most basic prevailing postage rates, with the highest denominations at only 5.00p and later, 10.00p, the local speed airmail rate. Now it has proven to be the most interesting and challenging series for serious collectors, especially the specialists, who search for varieties, including those that can be differentiated more readily with the aid of the ultra-violet light. 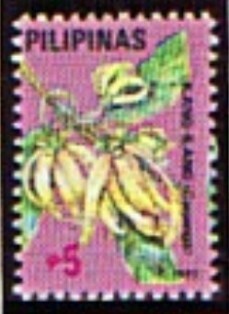 After the "Fiesta Islands" definitive series issued between 1989 and 1990, the Postal Services Office was planning a new definitive series to show Philippine fruits. However, it was later decided that Philippine flowers be depicted instead, as the new stamps will be in the new mini size, first used for the "Great Filipinos" series of 1989, and that the planned fruits may not come out nicely on such small designs. The reason given for coming out with such small stamps was that even though the demand for postage stamps had increased tremendously, the budget for stamp printing had remained the same. Therefore, with 200 stamps per sheet instead of the usual 100 for definitives, the Post Office can have definitive stamps printed to meet the demand without having to alter the size and quantities for commemorative and special issues. This flower series was slow to catch on with collectors, probably because of its size and also the number and face value of the stamps included. But recently, it has begun to soar in popularity, largely due to an increase in interest for Philippine stamps and the desire of more collectors to include collectible varieties, especially after the two locally published albums included the flower reprints with "1992" date in their supplements. Since several of the flowers to be depicted exist in different color morphs, the stamps for the four basic postage rates (1.00p for local mails, 4.00p for mails to Asian countries, 4.75p for mails to Middle East countries, Australia and New Zealand, and, 5.50p for mails to U.S.A. and Europe), which were needed in large quantities, were each printed as se-tenant blocks of four to show four different colors of the same flowers. This contributed to the large number of stamps in the series. All the stamps in this series were printed by litho-offset, in four colors, in sheets of 200 subjects (20 x 10), by Amstar Company, Inc., on the locally produced paper with the "Seal of the Bureau of Posts" watermark. Under ultraviolet light, the local paper, in used condition, varies in its reaction to the UV light, from being 1) non-reactive (ordinary paper), to (2) slightly fluorescent, to (3) highly reactive ("hibrite" paper). All stamps in this series exist with at least two paper types, with many having three different types and some even four types. All these stamps were comb perforated 13 3/4 x 13 1/2 , and have the yellowish-green phosphorescent security mark, either "PPS" or "PPC", printed sideways on the face of the stamp. Since the budget for stamp printing is released quarterly, orders for stamps, including definitives, are also usually made on a quarterly basis. The initial quantities ordered are the ones shown on the new issue bulletins, but for most values, there will be additional orders or re-printings on the succeeding quarters, depending upon the need for that particular value. However, such additional quantities are not being reported anymore. Aside from the additional quantities from the quarterly reprints, most printings will have further additional supplies from what is called renegotiation. Before, the printers delivered only the exact quantity ordered, regardless of whether there are still good copies from the extra print run made to cover possible spoilages. But since 1989, the Post Office has been renegotiating with the printers for additional quantities of good stamps included in the over-run that used to be destroyed together with the spoiled stamps after the ordered quantities have been delivered. The printers were allowed an additional percentage for spoilages when they were supplied with the security paper, so as to be able to fill the ordered quantities completely. Most of the time, there will be lots of good sheets left after the ordered quantities have been delivered in full, so to avoid wastage, any such acceptable sheets were delivered as additional quantities at 50% of the original price. These are usually used for postage purposes only, since it often takes months before such renegotiated stamps are delivered to the Post Office, and by that time, many commemorative and special Issues have already been taken off philatelic sales. The printer first accumulates as many issues as possible before delivering these renegotiated stocks together. It should be noted that quantities ordered and delivered refer to the actual number or pieces of stamps for that particular value, regardless of the number of designs in the sheet, therefore, for stamps in block-of-four formats, the quantity reported will have to be divided by four to get the number of blocks printed for that value. Part I of this flower definitive series, consisting of five values with eleven stamps, was scheduled for issuance on March 30, 1991. However, since that was a Saturday, the actual first day of sale was April 1, Monday, and only the 1.00p and 5.50p blocks of 4 were available. The other three values, 60s, 75s, and 3.25p, were not issued until April 11, 1991. There were also additional printings ordered for the third and fourth quarters, but by then, the printer had already decided on its own to "redraw" part of the plates (black color) to make the date "1991" bigger and/or to adjust the positions of the inscriptions. The reason for these Type II versions is that the printer wanted to avoid unnecessary spoilage due to misperforations. 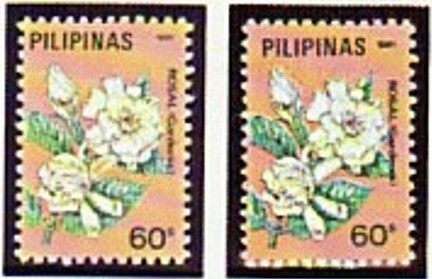 In the original Type I printings, a slight shift in perforations will cut through the "PILIPINAS", "1991", name of the flower or face values due to the extremely small size of the stamps, and all such misperfed sheets are considered spoiled. The Post Office was not notified of these stamp changes, so very few are aware that major varieties had been produced, and almost all of the 75s and 3.25p Type II stamps had been used up for postage, and mint copies can be considered rare. In fact, even good used copies of any of these flower mini-stamps are difficult to locate, because of its small size, the rubber cancels used have such thick lines and the violet ink used "bleeds" when soaked in water. 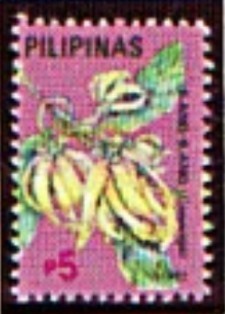 “1991" was enlarged; the name of the flower is in slightly bolder type; "60s" was moved upwards and away from the right vertical perforations; and "PILIPINAS" was moved away from the left vertical perforations, so it is closer to the larger date (1991). 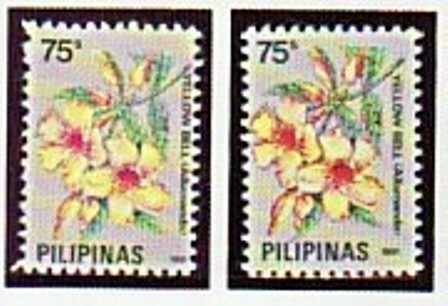 "1991" was enlarged and set higher and more to the left; the name of the flower was moved slightly lower and away from the right vertical perforations; "75s" was moved slightly lower and away from the left vertical perforations; and "PILIPINAS" was moved upwards and away from the left vertical perforations, so it's much closer to the larger date (1991). "1991" was moved away from the left vertical perforations, so it's no longer below the edge of the twig but clearly to the right of it; "P1" was moved away from the left vertical perforations; and "PILIPINAS" was moved slightly away from the right vertical perforations, making it closer to "1991". 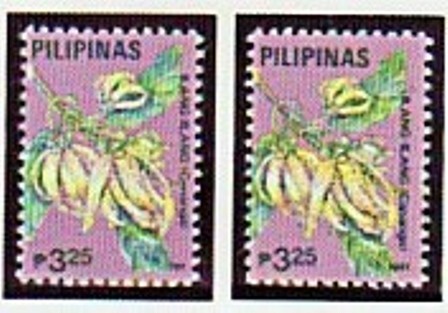 "1991" was enlarged and moved higher and away from the right vertical perforations; the name of the flower was moved down and away from the right vertical perforations; "P3.25" was moved upwards and "PILIPINAS" was moved slightly downwards and away from the vertical perforations. "1991" is in slightly bolder type and moved away from the right perforations; "P5.50" was moved away from the right vertical perforations; and "PILIPINAS" was moved away from the left vertical perforations, so it is much closer to "1991". From all the printings for Part I of the flower definitive series comprising a total of 22 stamps, there is only one EFO recorded, unlike before when the APO-NEDA was the printer where there were all kinds of EFO's for most stamps. Only one sheet of the 1.00p Type I stamps was found with the four colors misaligned; the black and the yellow are shifted to the left, so there are yellow "extensions" of the branches, and the flowers have their outlines doubled. 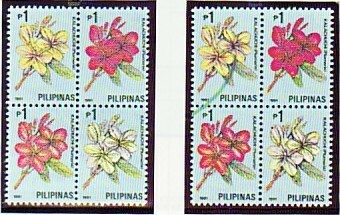 Part II of the Philippine flowers definitive series comprising four values with ten stamps was scheduled for issuance on May 17, 1991. However, none of the stamps were available for sale until June 7, 1991. There are no Type II versions for these Part II stamps because the printer started with designs having the black inscriptions in the "correct" positions already. From Part II, there is only one EFO recorded. It's from a sheet of the 4.75p with the upper left corner folded back during printing, perforating and trimming, so when the folded portion is opened out, the unprinted area is bigger than it should be if properly trimmed; the irregular piece of unprinted paper has perforations running at an angle. The upper left corner stamp is 2/5 blank, with perforations on the left side running wildly, while the stamp below it has the upper left corner unprinted, and has the perforations flaring out. With the postage rate hike that became effective on December 1, 1991, a whole new range of eight values using the same designs as the first two parts, except the 75s yellow bell, was supposed to be released on that day. However, only the four values for the four basic rates, all in se-tenant blocks of four, were available on time. The other four single values were sold starting December 13, 1991. The, designs and colors for these eight values, comprising twenty new stamps, are the same as those for the first two parts, except that instead of black ink used for the denominations, the new denominations are in different colors. It should also be noted that designs from Part I will be of the type II versions. These eight values were included in the last quarter orders, and some values have additional renegotiated quantities. Orders made in 1992 bear the date "1992", to identify them as new printings for which the printer was charging higher prices, and also to differentiate them from renegotiated quantities which cost only half the original price. Therefore, new printings bearing the "1992" date are to be considered as new stamps for philatelic purposes, and becomes Part IV of this definitive series. "SPECIMEN" STAMPS - After the printing of "SPECIMEN" stamps was terminated with the last issue of the first quarter of 1989 (Fiesta Islands '89 1), due to allegations of inequitable distribution and late deliveries that negated the primary purpose of these promotional items, there was a clamor for the resumption of these collectibles. But it was only when the establishment of the Postal Museum and Philatelic Library was being undertaken that the idea of resuming these "SPECIMEN" stamps became attractive again. So with the Philippine Bar Association issue of August 20, 1991, printing of "SPECIMEN" stamps resumed, and almost all stamps and souvenir sheets issued since then were overprinted. Initially, only a few sheets intended for display and for the files of the Philatelic Library were printed, but later on additional quantities were approved in order to make some available to editors of philatelic publications and deserving collectors and dealers. One thousand (1,000) pieces of each of the eight values from Part III were overprinted with black "SPECIMEN", positioned diagonally with the "S" at the bottom reading up. The face values were deleted by two horizontal lines in black ink by hand and not printed, so the length of the bars and the distance between them are variable. In fact, even the placement of the word "SPECIMEN" is not in the same position for all stamps on the sheet. These 1,000 "SPECIMEN" stamps were made available free of charge and were additional quantities, and not part of the ordered quantities. Such stamps were intended primarily for the Postal Museum and Philatelic Library. It should be noted that for the four values in se-tenant blocks, only 250 sets are possible. From part III, only a single sheet was found that produced some EFO's. It's a sheet of the 8.00p with the bottom two rows affected. From the lower left block of 20 (0 x 2), there is a confetti flaw (foreign piece of paper stuck on stamp #7, but free over stamps # 5, 6). When folded over, large areas of these latter two stamps were unprinted, as the printing got onto the confetti. From the lower right block of 20 (10 x 2), stamps #4-10 have large areas having background colors misprinted due to presence of glue or other foreign substances over them during printing. Part IV of the flowers definitive series consists of reprints ordered in January and March of 1992 having the new date "1992" and with the original "PPS" security mark. No additional reprints were ordered until the third quarter, and by that time, the Postal Services Office had become the Philippine Postal Corporation (Philpost), and the phosphorescent security mark was changed to "PPC". In addition to the eight values from Part III, there were printings made of the 60s and 1.00p using the type 11 varieties, included in the Part IV stamps, making the complete set 10 values for a total of 25 stamps. Two different EFO's appeared with this group, both on the 7.00p value. The first is a right side block of 20 (2 x 10), which has an additional row of comb perforations at the right, partly on the stamps and partly on the margin. The vertical perforations of the extra row is slanted, and it is 7 mm. to the right of the normal row on top but only 5 mm. to the right at the bottom. The second EFO is a lower left block of 32 (4 x 8), with the second vertical rows of stamps (from the left) misaligned vertically because the comb perforations jumped up 1 mm. causing each stamp to he higher than its adjacent stamps horizontally. When the Postal Services Office become the Philippine Postal Corporation on June 3, 1992, the printer was instructed to change the phosphorescent security mark from "PPS" to "PPC" for all new printings of stamps. The third quarter orders for additional printings of the flower definitive series were among those affected, so Part V of this series was created. This time, the 60s and 10.00p values were not included because of low demand. Therefore, this part V consists of only eight values with 23 stamps. There were actually three reprint orders for these stamps with "1992" date and "PPC" security mark. There was an order during the third quarter and two more during the fourth quarter. However, the last order was for delivery in January of 1993, including the new 1.00p with design of the yellow bell (from the 75s value in Part 1). There are two types of the 5.00p stamp from Part V.
Type I has the "1992" closer to the right vertical perforations, with "2" out of alignment from the vertically placed flower's name. Type II has "1992" aligned to the flower's name, with "2” in line with the inscriptions. It appears that the printer decided to change the position of "1992" after a short printing run of this value, that's why even though there was only one order during the third quarter, there are two types, and definitely type I is quite scarce. right block of 40 (4 x 10), with right marginal row of comb perforations shifted 1 1/2 mm. (exactly 1 perforation hole distance) to the left, cutting through the flower's name at right. 2.00p right block of 20 (2 x 10), with additional row of comb perforations at right, partly on the stamps and partly on the margin and slightly slanted, causing doubling of the perforations very clearly on the upper stamps but almost aligned on the lower stamps. The vertical row of perforations is 8 1/2 mm. to the right of the normal row. 8.00p upper left corner block of 8 (2 x 4), with upper left stamp having "3" instead of "8" for face value, because the red denomination was partially unprinted in that exact spot (constant on a small print run). 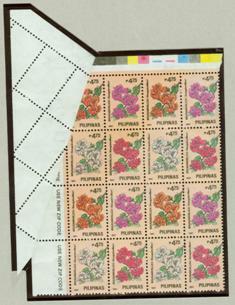 8.00p top block of 16 (4 x 4), with upper 2 yellow flowers having areas of changed colors (violet instead of yellow). The sixth and last part of this flower definitive series was issued as a single 1.00p stamp on January 23, 1993. This used the design of the yellow bell of the 75s from Part I. As expected, the design was the type 11 version, with "1992" high and close to "PILIPINAS". The new denomination was in blue instead of black. Actually, an additional order for the LOOP was needed and it was included with the second order of the fourth quarter 1992, to be delivered in January, 1993. Since there had been numerous complaints from collectors and the mailing public about the same monotonous flower designs, the authorities decided that since the current PL00 and P2.00 stamps, the most widely used values, both showed Kalachuchi, it might help stop more complaints if a new design was used. Thus, because the yellow bell was the only design not utilized for the printings since the rate hike, it was the natural choice. There was only one printing made, and with 140,000 from renegotiation added to the ordered quantity of 1,600,000, the total became 1,740,000. 1,000 pieces of this stamp were overprinted with black "SPECIMEN", positioned diagonally with the "S" at the bottom reading up. The face value was deleted by two horizontal lines in black ink by hand and not printed. The flower definitive series was replaced by the Flag with National Symbol definitive series, and with the new policy of "first in, first out," no more of these stamps should be available for sale anymore. For many collectors interested in general collections with face-different stamps only, 42 stamps may be considered complete already, but it will be a much greater challenge, offering more thrill and satisfaction, to include at least some of the other collectible varieties. Actually, to collect good used copies of this series is quite a challenge also, especially if intact blocks of 4 are to be included. Postally used covers showing the correct usage for each of these values will be good exhibition materials, too. In fact, it would be amazing to find covers showing the first day or early usages of the various reprints such as the type II's, "1992" -dated, and "PPC" security-marked varieties. I myself gained great pleasure and fulfillment studying this fascinating series, and I'm sure you will, too. Actually, to collect good used copies of this series is quite a challenge also, especially if intact blocks of 4 are to be included. Postally used covers showing the correct usage for each of these values will be good exhibition materials, too. In fact, it would be amazing to find covers showing the first day or early usages of the various reprints such as the Type II's, "1992" dated, and "PPC" security-marked varieties. I myself gained great pleasure and fulfillment studying this fascinating series, and I'm sure you will, too.